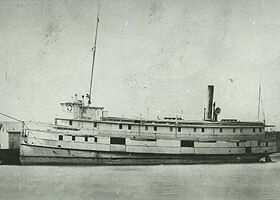 Description: When the steam barge Messenger caught fire at a dock in Rogers City it was cut free and allowed to drift out into the lake where it finally sank about 4 miles offshore. Its burnt hull sits upright on the lake bottom with rudder, engine and anchors still in place. 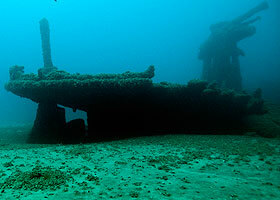 Link to historical information on this shipwreck.